I restored some of the values. While the darker shadows may be more true to the reality of the scene, the brighter details improves the art. Art is not about copying reality, but to interpret reality and discriminate in favor of a desired result. 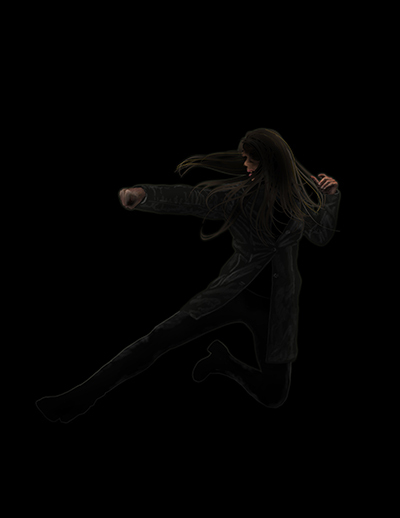 I added a hint of fur clad boots and some jeans texture, and I also added some motions blur in certain spots. I think I will sit on this one for a while as it’s close to being finished. It’s time to turn my attention to the content and continue with the editing process. I’ve been mostly tweaking tonight. With so many subtle shadows and weak light, I find that I’m dealing with a challenge the old masters of the renaissance never had to deal with – the shift in light and contrast between different computer monitors and (other devices). However, I have another advantage instead – the live editing capabilities of Photoshop. I’m not dealing with dry paint here, but opacity, layer styles and adjustment layers. I haven’t done much lately, on this painting that is, but I started to add a foreground of leaves. Trying out the title. I think I’ll keep the old one. It looks pretty good, right? Alright, a sky, some leafs…a blue shimmer from Lailie’s nocturnal eye. I’ll probably end up tweaking forever. It’s a bit tough to try to imagine what the lighting should look like since I don’t have a reference like I did with the church. I’m thinking I’ll have a subtle contrast of tree branches by the upper corners against the eventual night sky, and some autumn leafs in the foreground. I’m just winging it, really. 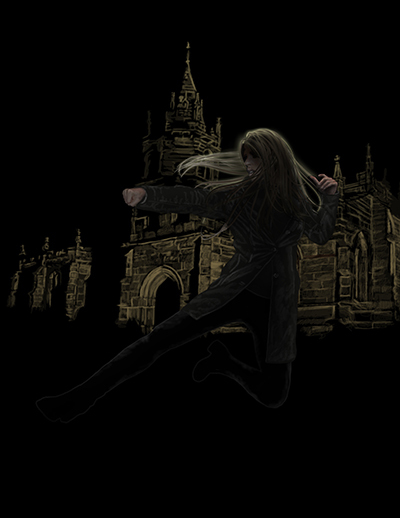 I have long ways to go, and I’ll have to add some motion blur to get away with that pose. Her hair is supposed to be almost white, so that will be adjusted. Other than that, I’ll just have to figure out where the light is coming from and add more texture in the highlights. She’s back lit and surrounded by city lights from afar. Perhaps there are street lights in the park along the paved path. 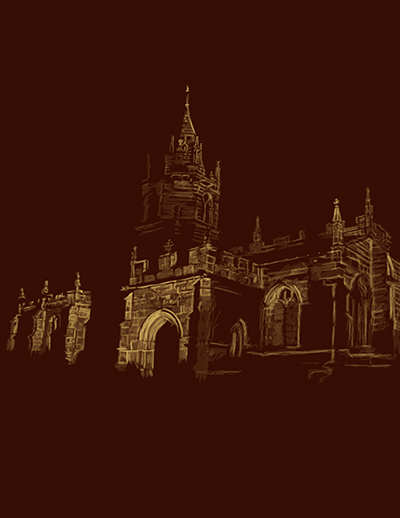 I just finished the rough of the church, and there’s a subtle sky, but I think I’ll leave it at that for now. Should there be a moon? Too visually cliché? Let’s move on to Lailie. I’m determined to publish the sequel this year. The rough was finished well over a year ago, and now that Nocs has been published, I can get back to editing Nocturnal Illumination. However, I can not proceed unless I get somewhere with the cover art. It’s a tedious activity that evolves over time. What I see in my mind is Lailie, (who I introduced at the end of the first book) as she’s about to attack her unexpected assaulter. 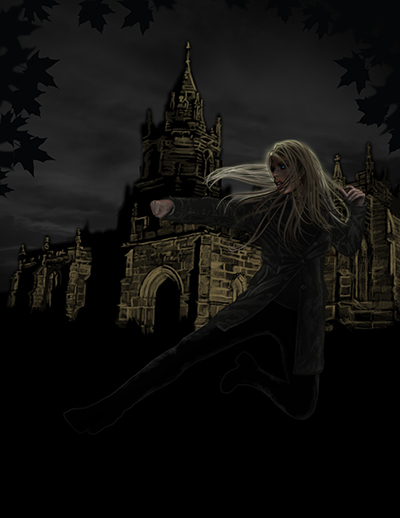 She’s walking through a dark city park surrounding an old church before the incident. 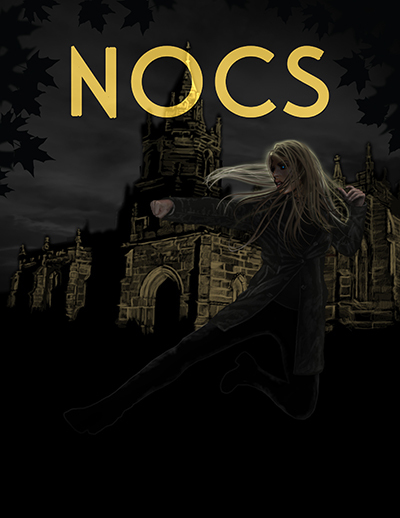 There is weak light emanating from the distant streetlights and from the spot lights on the church grounds, casting an ominous ambiance over the scene. It’s late fall with a humid chill in the air. Dead leaves are scattered across the park in droves, and as she kicks her way through, wet leaves stick to her boots. I have a reference photo which I bring into Photoshop. I outline major architectural elements and continue to build the details after I move the image to my second monitor so I can continue studying its details. It doesn’t really matter if I copy everything precisely in this case, only that I achieve the desired end result. I can only add so much to the church each time as my hand, arm, and elbow will cramp from the many small paint strokes applied with opacity using my Wacom tablet. The artistry lies in the choices I make while transferring my interpretation through my medium. I will not create a new post for each progression, but I will add them to this thread for those who are interested. Hence the date. 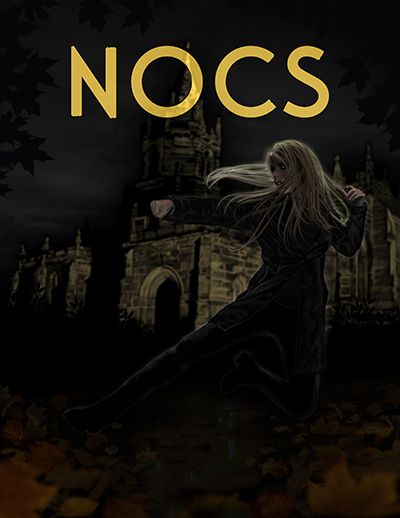 NOCS can be purchase here on Amazon, or you can read it for free through their Kindle Owners’ Lending Library. 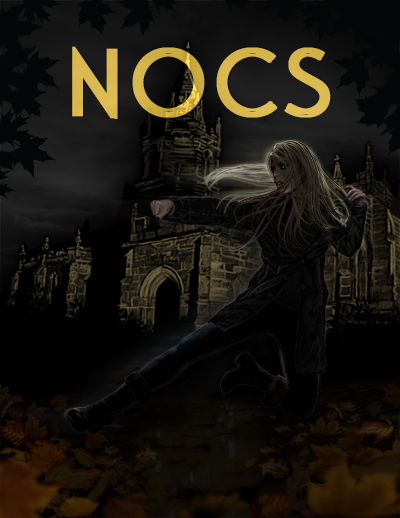 This entry was posted in Nocturnal Encounter and tagged chiaroscuro, Nocs, novel, sci-fi, sequel. Bookmark the permalink. 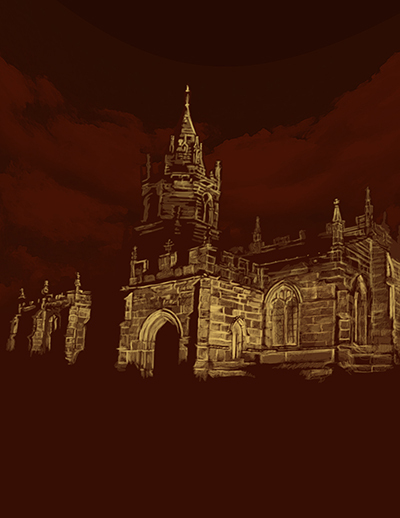 I don’t know much about the technical aspects of how you’re doing the cover art, but putting an old church in the background makes anything look dark & spooky. Nice!